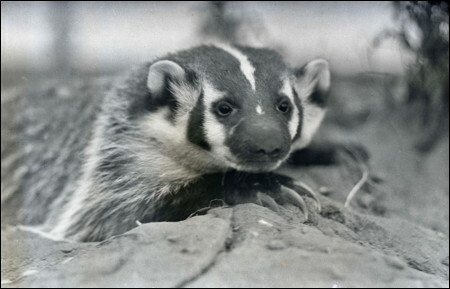 In the Northern Paiute mythology of eastern Oregon, during times of drought, Thunder Badger is the one who brings the rain, and makes the earth moist once again. Here are two versions of the story. The first is a text in the Paiute language collected by W.L. Marsden in 1923. It is followed by an English translation that retains the same syntax as the original. The second version is a reworking of that text into a poem by Jarold Ramsey in 1973. 1. Usu niniaba sakwaiina ka oka tapi pasape oka kai osogokaku osogokakukwesi oka pa pasape. 2. Usu niniaba paumaba pabi'i kumiba pidakwabatu tibiwagayu. 3. Husiabagayu usu niniaba mataiti hunakwatnizu tabe'ada paumaba temataiti usu niniaba. 4. Tihiwisi tugupa'atu anuna otnohu ka kumiakina yaisi paumakina oka tipe nasagwai'ikukina niniabakina tukwukwitsikina seda enikina. 5. Usu tibitsi huna semezu motohawoyua ibituhupodotu. 6. Usuta'a sikwi huna uniyuhu. 7. Usu niniaba mataiti oka tipe pasape kai pizapi tehuwina ku atsimapanana. 8. Otnohu ka tugupa'atu anudzakwi ka paumabituna yaisi ka kumiakina. 1. He, the-Thunder, when-is-angry that, that earth has-dried-up; that not moist-earth-has, that-moist-earth-he-desires-to-cause, that water dried-up. 2. He, the-Thunder, the-Rain Chief, the-cloud surface-on lives. 3. (He)-has-frost; he, the-Thunder sorcerer, a-badger-like appears; the-Rain Sorcerer, he, the-Thunder. 4. After-he-digs, to-the-sky he-lifts-his-head-up, then the clouds-come; then the-rain-comes; that earth cursing-comes; the-Thunder-comes; the-lightning-comes, evil saying-comes. 5. 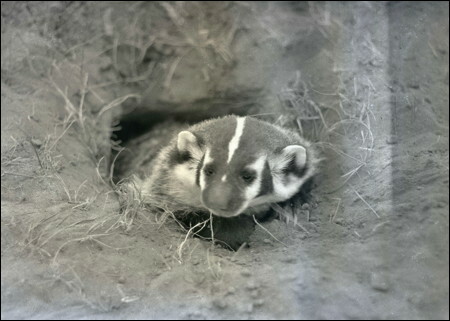 He, the-real badger, alone white-stripes-on-his-nose-(and) in-here on-the-back. 6. 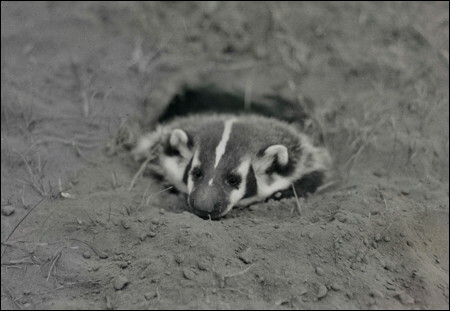 He-it-is just the-badger; this-kind-(it-is). 7. He, the-Thunder Sorcerer, that earth dried-up (does)-not like, (when)-digging, in-that-manner scratching. 8. Then that sky-to raising-his-head, that the-rain-makes; then that cloud-comes. 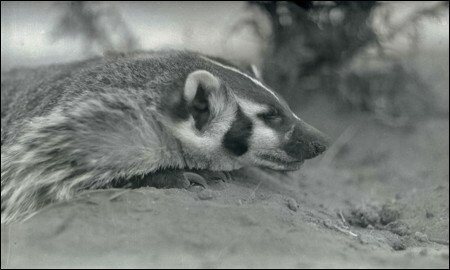 he is striped like any badger. he wants the earth to be moist. then the rain comes down all over. 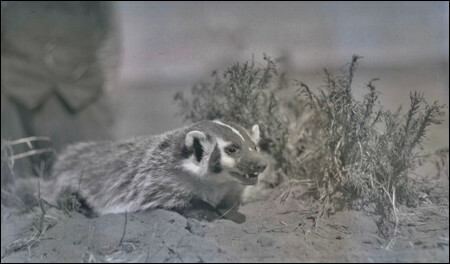 The badger photos are by Oregon wildlife photographer William L. Finley, taken during a 1917 trip into the Northern Paiute country of eastern Oregon.